Drywall is one of the most popular building materials. It can be used for many decorations, it is convenient to install, and besides, it does not limit the imagination of designers. suspended ceiling of plasterboard is usually used for extra soundproofing. Multilevel suspended ceilings have a more complex structure, due to which they can be equipped with lighting. Handmade Installation of multilevel suspended ceiling systems can be performed by even one who has never encountered such works. Plasterboard need to strengthen the by aluminum profile with the guides. This allows you to create a skeleton space which enables it to hide all the utilities and wiring. Visually increase the space, creatively modifying the geometry of the room. Hide imperfections and defects in the base ceiling where traditional decorative finish is not able to eliminate them. suspended ceiling systems of multilevel plasterboard successfully camouflage various communication - electrical wiring, ventilation system, water supply pipes. 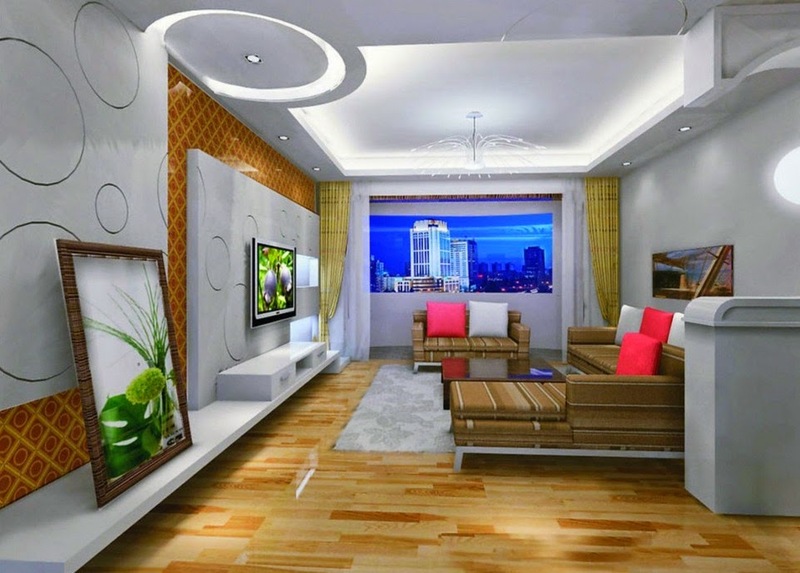 Through various forms and changes in elevation suspended multilevel ceilings shared apartment in which there are no interior walls (studio apartment), functional zones - dining room, living room, hallway, etc. 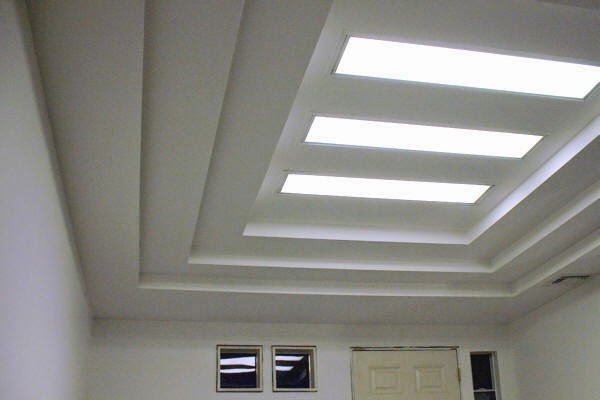 Solve the problem of lighting by installing lamps on different planes ceilings. Reflecting and intersecting rays form on top of the complex combinations of light and shade. Increase the choices of space thanks to the use of different colors and textures. laborious installation of suspended ceiling of plasterboard, which often requires specialized expertise. Low humidity - by flooding the neighbors above, drywall need to be changed. The installation process of a multilevel suspended ceiling system of plasterboard is rather long, and contains a few basic steps. 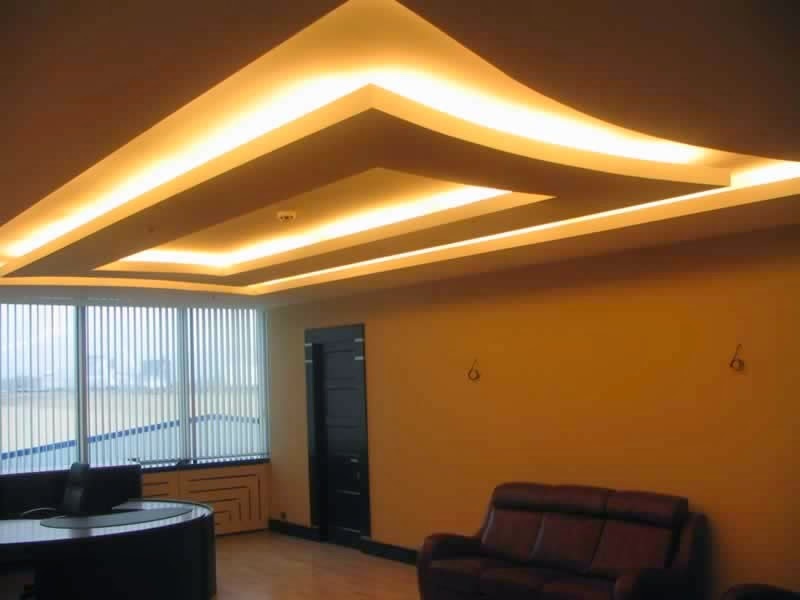 You must first decide on the future ceiling functionality, select the shape and dimensions. Then issue its decisions in the form of a scheme or drawing, include all of the details and elements. Proceed with the installation frame system for drywall. Ceiling can be mounted in two ways: to the slab and walls or only to the walls. Used in rooms with small areas. 1. draw a horizontal line around the perimeter of the walls, the selected height of the ceiling depending on the size of fixtures. 2. Then drill holes for fixing the frame. 3. Fix the frame with profiles created markup using dowels or screws. 4. Then install the longitudinal and transverse profile of the bearing elements, which have reinforcing ribs. 5. In conclusion, all the work going on sheets of drywall mounting self-tapping screws to the metal profile. It is used in rooms of considerable area. 1. As in the first method, perform marking the perimeter of walls. 2. Drill holes in the ceiling and walls, and then apply them in expansion plugs. 3. Attach to the ceiling hangers and adjust their length to align the profiles. 4. Then install the bearing profiles and plasterpoard sheets.